Diners who want a healthy meal often turn to salads, but salads often have hidden calories that add up quickly. According to Technomic’s 2018 Soup and Salad Report, 47% of diners say they order salad because they are trying to eat healthfully, and salad is a healthy option. But additions such as croutons and fried wonton strips, layered on top of greens, can make for a less-than-healthy meal. 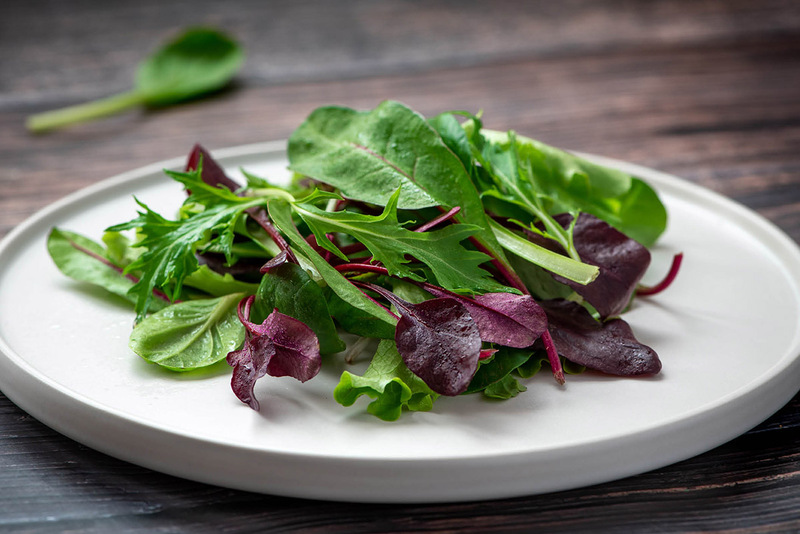 It’s up to restaurants and foodservice operators to meet the growing demand for salads that are low calorie, sustainably sourced and free from chemical additives. When foodservice operators hit the right balance of taste and good nutrition, a well-constructed, inventive salad attracts repeat diners. According to Technomic’s Soup and Salad report, 39% of consumers say they visit certain restaurants regularly because they enjoy the salad they offer. Expanding the menu gives diners more options and increases their interest. Some diners come to restaurants with calorie-counting apps in their phones that can research ingredients on the spot, while others might have researched a restaurant’s offerings online before they walk in the door. According to Technomic’s Soup and Salad report, 60% of diners say they are more likely to purchase salads described as low calorie. To meet these diners’ demands, many operators list calorie counts for salads and other foods on their menus. To help keep calorie counts low, reconsider toppings–add more veggies, seeds and plain roasted nuts, and cut down on candied nuts, cheeses and other high-calorie toppings. According to Technomic’s Soup and Salad report, 62% of consumers say that they’re more likely to purchase salads described as sustainable. Salads with locally grown and sustainably sourced ingredients taste great while satisfying diners’ desire for environmentally friendly foods. 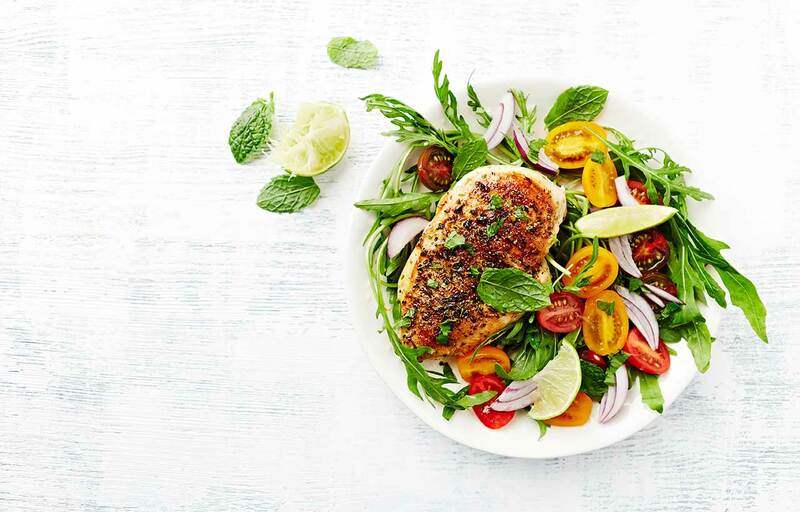 With 60% of consumers saying they would pay more for salads labeled high protein, lean options like grilled chicken salads tick off many of the boxes for those looking for a healthy meal. Other sustainably raised meats and fish can star in a healthy salad, set off by top-quality heirloom or organic vegetables. In addition to high protein and low-calorie options, many diners also look for all-natural food. According to Technomic’s Soup and Salad report, 72% of consumers say they would pay more for salads described as natural, while 70% say the same about salads with no artificial ingredients, and 64% say so about salads that are preservative-free. Operators can add “superfoods” such as blueberries, pumpkin seeds, and oranges, edamame or broccoli rabe to salads. These nutritional powerhouses are low calorie and all natural. 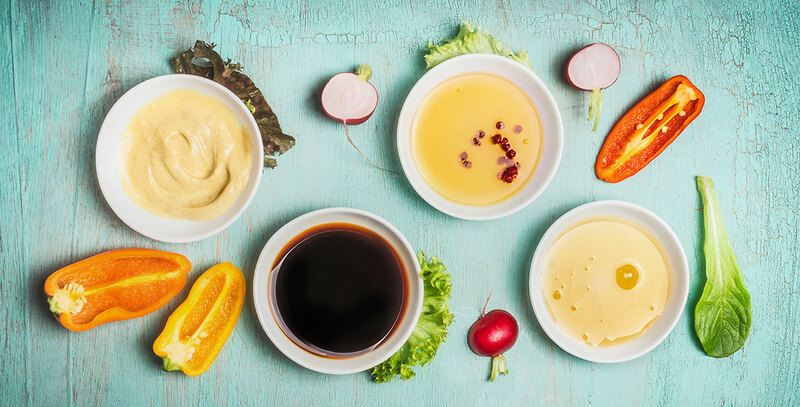 Beyond ingredients and toppings, 51% of consumers say that it’s important that a restaurant offers a wide variety of salad dressings. Used in moderation, dressings can add tremendous flavor. Marie’s® dressings are free from artificial flavors, preservatives, high fructose corn syrup and gluten. Clean label dressings like these put the finishing touch on a well-constructed healthy salad. A majority of diners want inventive, low-calorie, sustainably sourced salads with clean label dressings. 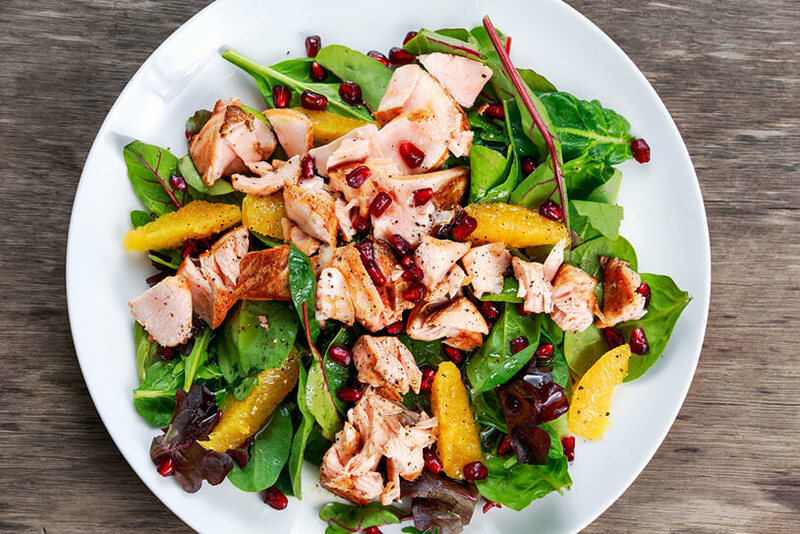 The payoff for creating a winning salad menu is a clientele that returns again and again, knowing they’ve made a good choice for their health. 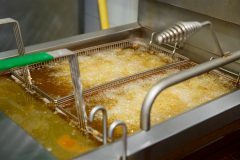 Operators should source better-for-you dressings, high protein options as well as sustainable proteins, low-calorie toppings and fresh veggies, in order to create the best salads possible for diners. When diners want to eat healthfully, 45% say they are doing so to feel better physically after they eat, but 41% say they do so just because they like the items they’re eating, according to Technomic’s 2018 Heathy Eating report. When ordering a salad, health benefits are just as important to consumers as taste. The most obvious solution for operators is to make sure that the veggies are crisp, fresh and cold when they’re served, but more goes into a salad than just making sure the lettuce isn’t wilted. 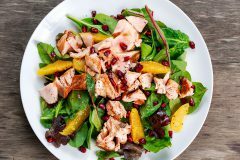 In order to make salads healthy, craveable dishes that diners seek out again and again, restaurant operators should be fully aware of the four main elements of a knockout salad. Starting with a great base sets up a salad for success. 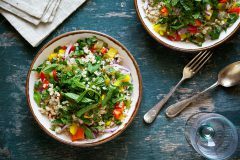 Whether using different greens such as spinach, romaine, kale, arugula or cabbage, grains such as quinoa or farro, or a combination of greens and grains, ensuring that salads boast dynamic color and texture is an idyllic start. Diners eat with their eyes first, so it’s essential for salads to look great in addition to tasting great. As for what greens and grains are hot right now, Technomic’s 2018 Soup & Salad report found that arugula has grown 67% year-over-year on limited-service restaurant menus while kale is up 31%, and at full-service restaurants, kale is up 45% while quinoa has grown 44%. According to Technomic’s Soup & Salad report, one in five consumers say the reason they order salads is because they try to avoid heavy foods at restaurants and salad is a lighter option. But just because these options are lighter in calories doesn’t mean they should be lighter on nutrition. 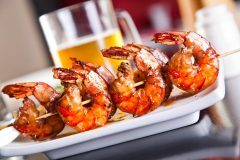 Operators can offer a range of different protein options so that diners’ different needs and preferences are taken care of. 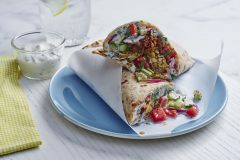 For instance, lean chicken is a common salad offering, as is salmon, but other options can include sliced steak (which goes great with crisp lettuce, red onion and blue cheese salad dressing), chickpeas (ideal for those looking for a plant-based option and perfect in Mediterranean salads), hardboiled eggs, black beans, tuna, sliced turkey, shrimp or tofu. 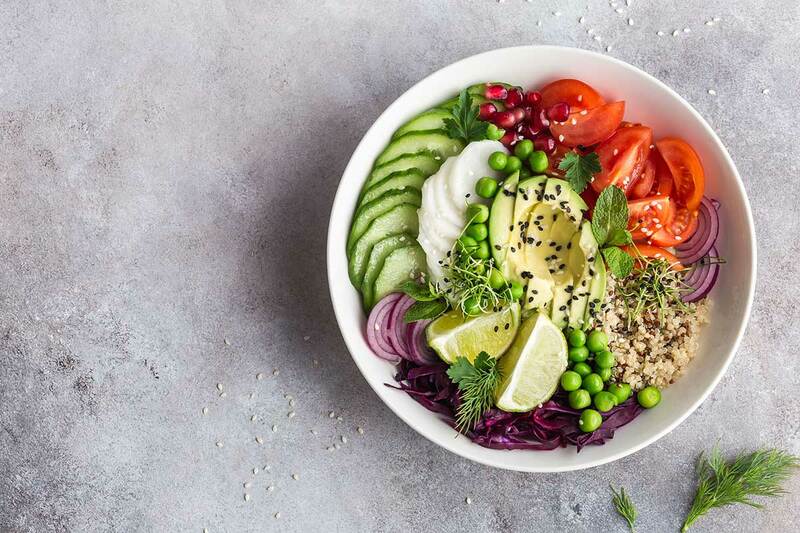 According to Technomic’s Healthy Eating report, 38% of consumers say they are willing to pay more for foods that are natural, while 35% say the same about preservative-free foods and 32% say so about foods with no artificial sweeteners. Dressings are an important part of making a delicious salad and, as such, should be given extra attention. For instance, dressings such as Marie’s are made with premium ingredients that make these prepared dressings as close to scratch-made as it gets, from taste to texture to quality. Made with no artificial flavors, preservatives, high-fructose corn syrup or gluten, dressings like Creamy Ranch, Italian Vinaigrette, Super Blue Cheese or Honey Mustard enhance all types of salads, from quinoa-and-kale blends to buffalo chicken and beyond. Offering unique toppings for salads is the final element to consider when building craveable options for the menu. According to Technomic’s 2018 Soup & Salad report, some of the fastest growing salad ingredients at limited- and full-service restaurants include arugula, pico de gallo, quinoa, sunflower seeds, watermelon, cashews, pepperoncini, Brussels sprouts and portobello mushrooms. Salad toppings run the gamut from the healthy and crisp (freshly cut veggies) to more indulgent and savory options (think wonton strips or crushed tortilla chips, roasted or candied nuts, cheeses and more). Many diners will expect the usual suspects such as broccoli florets and croutons, but operators should innovate their salad topping options a bit, too. Try offering pickled vegetables such as cauliflower, pomegranate arils, imported cheeses, roasted squash or carrots. Making salads appealing means ensuring diners will look for them when they want something healthy but also something that tastes great. By offering options with crisp greens, filling grains, lean proteins, great-tasting and all-natural dressings and unique toppings, consumers get what they want (healthful and delicious salads), while restaurants gain repeat business from diners who visit just for their favorite salads.